When USB3.0 was introduced, offering theoretical data signalling rates of 5 Gbps compared with the 480 Mbps available from USB2.0, the protocol became significantly more useful across a variety of applications. The latest standard to be published, USB3.1, further increases performance to 10 Gbps and reduces line encoding overhead. All flavours use a Type A standard plug as the interface to the host machine. To house small PCBs using USB as the external power and signal interconnect, Hammond Manufacturing has extended its 1551 miniature family with three new sizes: 35, 50 or 65 mm long; 20, 25 or 30 mm wide respectively; and all 15,5 mm high. The sizes were chosen after customer consultation to provide prototype builders and small-volume OEMs generous room for their PCB. 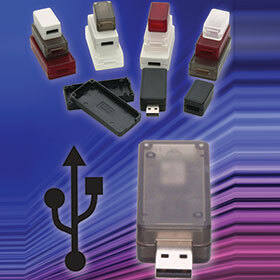 The 1551USB IP54 ABS enclosures are a traditional lid and base design. All versions feature a dedicated cut-out for a standard USB Type A plug in one end and have a recess in the lid for an inlay, label or HMI keypad. The two smaller units have two PCB standoffs moulded into the base, while the largest one has four. Each size is available in five colours with a satin texture finish as standard: RAL 9011 black, RAL 7035 grey, translucent clear, translucent smoke and translucent red. Custom colours can be supplied, and to reduce time to market and modification costs, all 1551USB enclosures are available factory modified with machining and silk screening to the user’s specification.